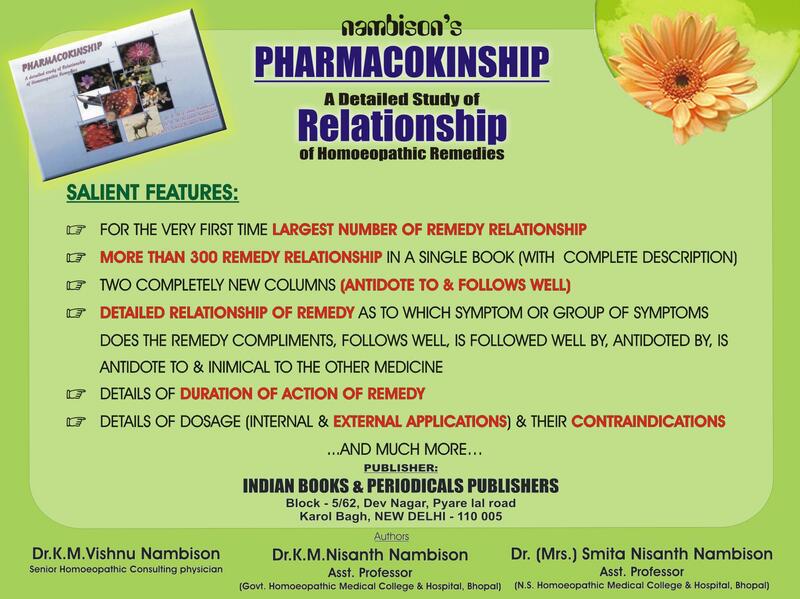 A book that was long awaited, a book of P.G level is in the market, it is interesting to go through the pages as every page brings new detailed information about different aspects of remedy relationship. 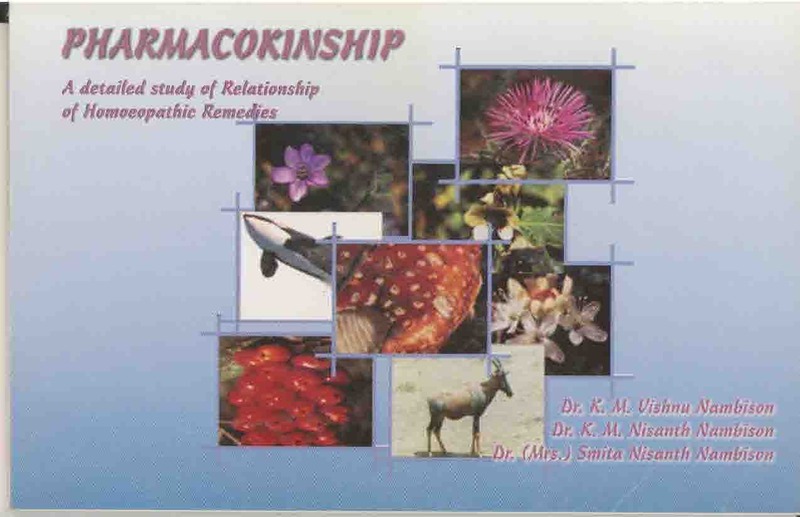 Although many books are available on this subject but PHARMACOKINSHIP contains the largest number of medicines, more than 300 remedies are listed in this book not to be found in any single book. Two completely new columns on (Antidote to & Follows well). 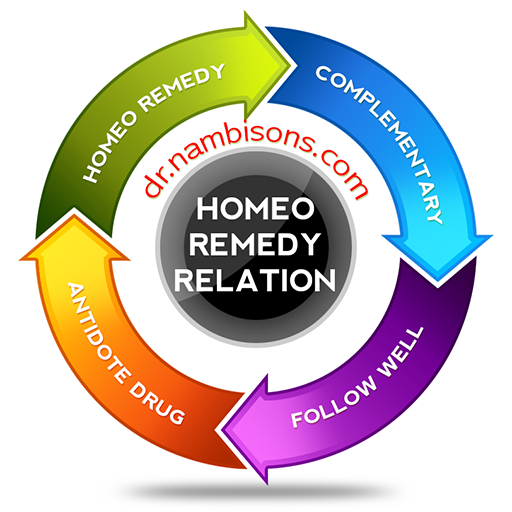 A key feature, which needs attention, is that merely knowing that a remedy compliments the other is not sufficient, but what is important is that in what symptom or group of symptoms it compliments other remedy is necessary to be known & this has been included in PHARMACOKINSHIP. Other feature includes details of duration of action of remedy details of dosage (internal & external applications) & their contraindications. It is worth adding to the library of practising Homoeopaths who are in need of refined knowledge & want to place a lasting reprieve to their case. Acet-ac China in haemorrhages After Chin. in haemorrhage, after Dig. in dropsy When given after Borax, Caust, Nux-v, Ran-b, Sars. Tab, Acon. (Sadness, Anguish) Nat-m, and afterwards Sep. (For gastric, Pulmonary and Febrile symptoms), Large doses of Acet-ac. are best antidoted by Magnesia or Calcarea either or fluid Magnesia or as lime water Acon, Coff, Euph, Ign, Plb (Colic), Sep, Stram,Tab, Anesthetics, fumes of charcoal and Gas, Op, sausage poisoning, Asar 14 – 20 d 3 – 30 potency. Not to be repeated too often except in croup. conditions. Sulph. is the chronic of Aconite, it will often complete an action that Aconite begins and will cure cases in which Aconite is apparently indicated but fails to relieve. Coff (In fever, sleeplessness and intolerance of pain) Arn, Coff, Sulph, Verat, Abrot, Ars, Bell, Bry, Cact, Calc, Cocc, Canth, Hep, Ipec, Kali-bro, Merc, Puls, Rhus-t, Sep, Spig, Spong, Sil. Acet-ac, alcohol, paris, Sulph, to large doses, free vomiting by emetics, wine, vegetable acid, vinum, vinegar Bell, Cham, Coff, Nux-v, Petr, Sep, spong, Sulph, Verat. 6 – 48 Hour Sixth potency for sensory affection, 1 – 3 potency for congestion. Must be repeated frquently in acute cases, in neuralgia tincture of root is preferable.